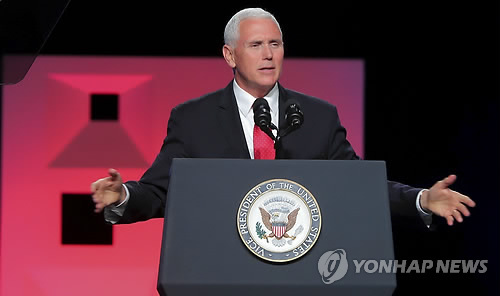 WASHINGTON, July 26 (Yonhap) — U.S. Vice President Mike Pence called out North Korea Thursday for its persecution of Christians and other human rights abuses. Pence has been an outspoken critic of the Pyongyang regime’s alleged human rights violations even as the two countries seek to resolve their standoff over the North’s nuclear weapons and ballistic missile programs. Speaking at the inaugural Ministerial to Advance Religious Freedom, the vice president highlighted the brutality of North Korea’s regime. “While we all hope that relations between the United States and North Korea continue to improve, and we certainly hope that the threat posed by North Korea’s nuclear and ballistic weapons program can be eliminated, there is no escaping the plain fact that North Korea’s leadership has exacted unparalleled privation and cruelty upon its people for decades,” he said during the event hosted by the U.S. State Department. “Torture, mass starvation, public executions, murders and even forced abortions, and industrial scale slave labor have been the means by which that regime has retained hold on its power for more than 70 years,” he said. North Korea bristles at such charges, viewing them as a U.S.-led campaign to topple its regime. Pence pointed to a North Korean defector in the audience, who he said was imprisoned and tortured for possessing a bible her mother had given her. After a botched escape attempt, North Korean authorities forced her to abort her child. Pence met with North Korean defectors in February when he traveled to South Korea to attend the opening of the PyeongChang Winter Olympic Games. He was accompanied by the father of Otto Warmbier, a U.S. college student who died last year after being detained in the North for more than a year.